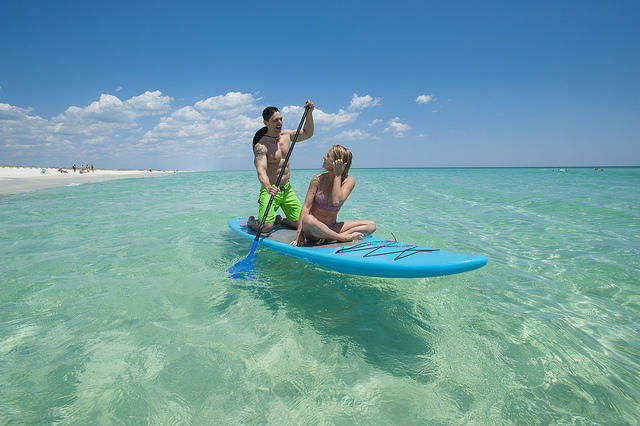 You Could Paddle All the Way Around Florida — Or Better Yet, Why Not Stick Around Pensacola? Just in case you wanted to paddle around all 1,515 miles of the entire state of Florida, we have a trail for that. It’s a mouthful. The Florida Circumnavigational Saltwater Paddling Trail — we thankfully call it the CT — starts right here in the Pensacola Bay Area. 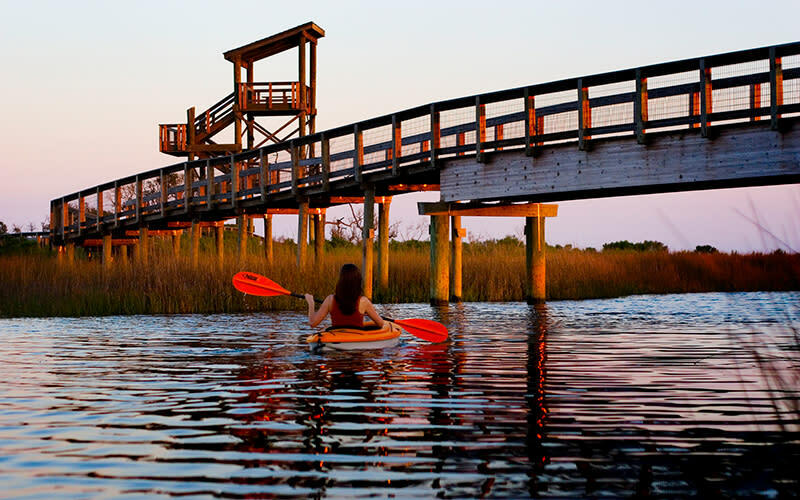 Kayakers can navigate protected waterways around the Florida peninsula. It’s an epic journey, an aquatic version of the Appalachian Trail that takes you along more than 500 years of Florida history, through waters once plied by Spanish explorers and pirates, around the swamps and mangroves of south Florida and up through St. Augustine and finally, Jacksonville. Pensacola’s gorgeous 23-mile-portion of the CT route spans from Perdido Key’s Big Lagoon State Park to the sugar white dunes of Big Sabine Point on Pensacola Beach. You can find all the charts and instructions on the CT’s home site and plenty of advice from expert paddlers who have paddled this magnificent and challenging journey. Not an expert? Whew, me either... So why not stick around and really explore parts of our neck of the CT? You can kayak or paddleboard, and then take a break to enjoy some fresh seafood, take in some live music, and yes, a refreshing post-paddle cocktail. Now that’s what I call trail-blazing. A wildlife viewing tower overlooks the CT launch point in Big Lagoon State Park. They want you to head straight out into the channel to start your journey. Instead, explore the lagoon. It’s alive with blue crab and redfish, which skirt the seagrass and share its silent waters with the swish of your paddle. Meandering saltwater channels lead to broad areas of pristine waterways teeming with birds and sea life. Along the shore, you can see blue heron and the smaller, green heron and rare marsh birds. Plenty of spots to sit for a spell and dip into that cooler you strapped to the deck of your board or the stern of your kayak. Heading out into the main channel leads you out into the Intracoastal Waterway and the first 6 miles of the CT. But instead of heading east, take a right and head west toward the sunset. You should hear the music as you pass under the high arch of the Theo Baars Bridge — the gateway to Perdido Key. A short paddle to the north shore of the Intracoastal takes you to Hub Stacey’s on the Point. It’s a fantastic sandwich joint — complete with live music and boat ramp. Across the south side of the canal — carefully traversing the boat traffic — you can find the aptly named Sunset Grill at Holiday Harbour Marina. It holds a commanding view of the ICW and a fantastic sunset. Food’s good too! The CT (which we already broke, because we went west, but that’s what roof racks are for! ), winds along Johnson Beach into Pensacola Bay — across the pass from Fort Pickens and Gulf Islands National Seashore. Leg 2 of the CT.
Gulf Islands National Seashore is a national park that skips along the shores from Florida to Mississippi. But Fort Pickens is its crown jewel. Quietly paddling along the shore, you can see fortifications and cannon emplacements dating back to the Civil War. Overhead, don’t be surprised to see the Blue Angels flying in formation around their nearby roost at Sherman Field. Pensacola Bay is a rich fishing area, and you’ll likely see the skilled native anglers: dolphin, pelicans, herons and osprey, plucking their catch from its blue waters. Paddle east for nine miles and you’re heading into commercial Pensacola Beach (I mean if you were sticking to the CT). Here, the sand dunes and sea oats are dotted with condos. A hidden inlet will take you into Pensacola Beach’s favorite pirate haunt, Peg Leg Pete’s. But actually, you can drive those nine miles and put in one of several spots, like board rental spots along Little Sabine, or Yolo Adventures, Key Sailing and other outlets along Santa Rosa Sound. This is my favorite part of the mini CT — you can paddle right up to spots like The Grand Marlin at the foot of the bridge or even Hooter’s, Hemingway’s Island Grill and Flounder’s along the Portofino Boardwalk. Paddle past the restaurants and you’ll hear some loud sounds from local wildlife. Nope, not dolphins or osprey or great blue heron. The Paradise Lounge and its unassuming, clean and spartan Paradise Inn light up the weekend afternoons and evenings. The Paradise is a favorite local food and dance stop for boaters, paddlers and landlubbers alike. Or… you can choose to continue paddling on — you only have 1,490-some miles to go! Stick around and trail-blaze right here. Sean Smith is a native of Liverpool, England, but has been Gulf Coastified since he moved to Pensacola in 1992 after serving as a weather specialist in the Air Force. A journalist and writer for more than 20 years, he loves to share his affection for the natural beauty of Pensacola and the Northwest Florida Gulf Coast.